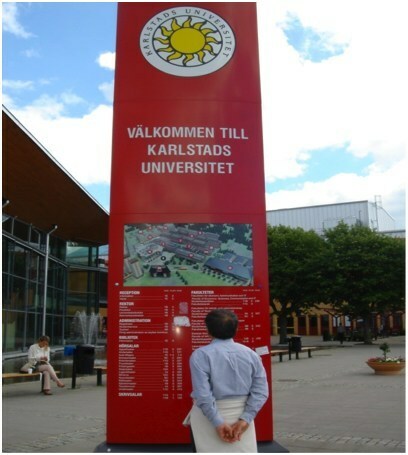 The 19th annual frontiers in service conference were being held in Karlstad, Sweden at Karlstad University on June 10-13, 2010. Karlstad is a city was situated between Stockholm and Oslo, where the Klarälven River flows into Lake Vänern from the north. One of the youngest universities in Sweden is Karlstad University. Karlstad University is a modern, open and innovative university that conducts high-quality education and research. This makes the university a little more modern; a little more adventurous. The Annual frontiers in service conference was founded in 1992 by Roland Rust, and is considered by many to be the world’s leading annual conference on service research. The conference has a very global nature, and generally draws attendees from 35 countries or more from around the world. Professor Kijima and his doctoral Student, Santi Novani attends to this conference to present paper with title Symbiotic Hypergame Analysis of Value Co-creation Process in Service System. On Thursday, June 10, 2010, we attend the welcoming reception at Clarion Hotel Plaza. We met with other researcher and especially for Santi met researcher from the same country, Indonesia. We present our paper on Friday, June 11 2010 in 11B240, at session 5 from 15:30 -15:55. To prepare the paper, intensive discussion and rehearsal for the presentation was needed. We did rehearsal for this presentation many times. The discussion with our supervisor, Prof. Kijima is an important part to improve the quality of the paper. Also, discussions with members of the laboratory help us to improve our confidence to explaining and answering the model. There are some professors who interests in this topic and give some comments and questions, since value co creation by using mathematical formulation was very interesting. Our paper discusses how mutual understanding can be achieved between entities in service system, i.e., customer and provider by using symbiotic hypergame. Symbiotic hypergame is the most adequate to describe value co-creation process in service system. The Frontiers in Service Conference features a unique international mix of business people and academics, and a cross-functional list of topics, including service science, service marketing, service operations, service human resources, service infmation technology, e-service, service innovation, and customer relationship management. Speakers at the conference include many of the leading service experts, including high-ranking executives and prominent academics from around the world. We enjoy this conference in Sweden and we met other researchers to share information and build our relationship and networking. Also I joint meeting with the student which organized by IBM. In this discussion, professor from IBM discuss about smarter planet with all of students who attend this conference. Many experiences we found through the conference and may be it would be the first step of our carrier as researcher to learn and understand the world of researchers in service area. We hope we can attend this conference in 2011. Goodbye Karlstad and see you at the next Frontiers in Service conference in 2011, at Colombus University, Ohio. ©Copyright © 2005 - 2019 Kyoichi Kijima. All rights reserved.